For a long time, it has been known that there is some form of dietary link with depression. It doesn’t take a genius to look around and notice that people with depression often don’t have the best diets (although there are exceptions), but that brings up a chicken or the egg situation. Do they have poor diets because of the depression leading them to care less about their diets? Or is their poor diet one of the key factors in their depression? I believe it is likely a combination of both. Having worked with quite a lot of people with severe depression, I can clearly see that there are a lot of times where they throw any care in the world about good nutrition out the window, no matter how dedicated they are at other times. Often a short phase in a single day or two is enough to reverse the progress that they made over the rest of the week. At the other end of the spectrum, I have noticed that when they improve their diets, they appear to be at a much lower risk of these “episodes” getting the better of them – however this is only anecdotal. Honestly there isn’t much research regarding actual nutritional interventions, so much of this post is based on a recent study called The SMILES Trial. This was the study that peaked my interest in the topic. Before this there was a clear observational link that was backed by research to a certain degree, but there were no actual interventions that had been shown to improve symptoms. The SMILES trial resulted in a massive reduction in depression symptoms. The Smiles Trial was a 12-week study that included 66 people (after 99 were excluded for factors such as changing anti-depressant medication and other variables) who were classified as having severe depression. Most participants also had severe anxiety. The number of participants is much smaller than desired, but it doesn’t make the study worth disregarding. The authors even said that they thought the results wouldn’t be able to reach statistical significance due to the smaller sample size, but since the results were so large it is still likely to be relevant. One downside is that 12-weeks isn’t really a long enough time to measure dietary behaviour changes, since often people revert to old habits over the long term, but from another perspective it also shows that it only took 12 weeks to get solid results. Everybody who was included in this study was classified as having a “poor diet” to begin with. It is worth noting that only two people were excluded from the study due to having “good diets.” That being said, this isn’t just representative of people with depression, the vast majority of people would be classified as having a poor diet based on the scale they used. There were two groups utilised. 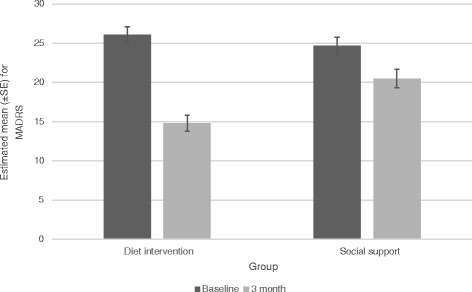 A dietary intervention group and a social support group. The social support group basically involved a one on one conversations about nothing in particular (intentionally no psychological techniques were being implemented since that would be an unwanted variable) or they would play board games. This was to control for the fact that the intervention group got to spend 7 sessions with a dietitian. Social interaction is extremely valuable for individuals with depression, so this was to account for the fact that potentially somebody may improve their symptoms solely through interacting with a dietitian – which would hide whether it was the diet or the interaction that led to the improvement. 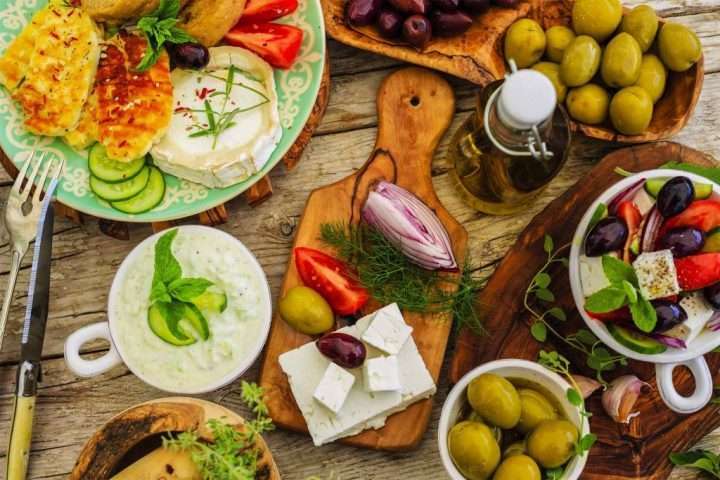 The style of diet used was a modified Mediterranean diet based on a combination of the Australian Dietary Guidelines and the Greek Dietary Guidelines. I’ll detail exactly how to implement the diet later this post, but the key factors were that they were very low in “unhealthy foods” and had large amounts of wholegrains, fruits, vegetables and healthy fats. One massive variable that I am extremely happy that they accounted for is weight. If somebody’s weight changes (either up or down) it is likely to affect their symptoms of depression in some way. To account for this, the diet was deliberately set up to involve exactly enough calories for people to maintain their weight. The diets weren’t controlled, so even though people could choose to eat how they wanted to, they ended the trial at roughly the weight they started at. This made it clear that the improvements were related to the quality of the diet, not the fact that their weight changed. It is also worth mentioning that because people had control of how they ate, they didn’t follow the recommended diet strictly. For example, the diet involved 60ml of olive oil (a ridiculous amount, which is >450 calories) per day, but the participants averaged ~20ml throughout the trial. Although they didn’t make all the changes recommended, they did make great strides towards the proposed diet. As another example, they also were told to keep to a maximum of 3 “discretionary” serves per week, and while they didn’t get there, they reduced their original intake by a massive 21 serves per week on average. Severity of depression was based on the MADRS scale, with anything below 10 being classified as being in remission. In the intervention group 32.3% of people got into remission, which is incredible considering they all had severe depression at the start. Around 21% of people went into remission for anxiety as well, which is interesting because I didn’t expect that link to be as strong. Interestingly, 8% of people in the social support group went into remission for depression as well, showing that social interaction did play a role. These results are incredible no doubt, but it brings up a question to ponder: If people didn’t really come that close to following the prescribed diet, would the results have been significantly better if people followed it completely? Regardless, it is a very “real world” trial which is important since the people who are going to try improving their symptoms are going to be in real world, rather than in a lab being fed all their food. A 32% remission rate is a great statistic by itself considering diet is only one piece of the puzzle. This is the interesting part. I’ll lay out the diet how it is listed in the study, based on the number of servings per day. The serving sizes are based on the Eat for Health Guide and you can find the exact serving sizes in the links in the middle of the page. The diet also involved reducing intake of ‘extras’ foods, such as sweets, refined cereals, fried food, fast-food, processed meats and sugary drinks (no more than 3 per week). Alcohol consumption beyond 2 standard drinks per day were included within the ‘extras’ food group. They also said to only eat until full. This means that although the servings are listed, it is more of a ratio rather than a strict plan. What Would I Change About the Diet? Being honest, I have never used this diet 100% as it is laid out with any of my clients. A big reason for this is because most of the clients I see who would benefit from this, also have interest in losing weight. Others may disagree with me and try to take the focus off of weight, but I personally prefer to try to assist the client to lose weight at the same time. The diet was also intentionally set-up so that people would maintain their weight, just to eliminate that variable. Since outside people trying to follow this diet aren’t being researched on, there is no real need for that aspect. The first change I would make is to reduce the amount of olive oil from 60ml down to <20ml. I’m a massive fan of olive oil, but I also prioritise total calorie intake and flexible dieting. This change alone would reduce calorie intake by >200 calories. I would also reduce the whole grains consumption from 5-8 servings down to a lower target. This would be based on the individual, but likely 3-4 servings. Potentially I would also reduce fruit and dairy very slightly as well. These changes would create a larger than desired calorie deficit if followed strictly, but that is intentional. Nobody is going to stick to 3 discretionary serves per week. Most health obsessed people would struggle with that, let-alone somebody with less interest in healthy eating. By reducing the calories consumed through the core food groups, it leaves a little bit more flexibility for when people overconsume calories elsewhere, while also hopefully still maintaining the desired calorie deficit for weight loss and sticking closely enough to the desired diet to get positive outcomes in terms of depression. This study is ground-breaking research in my eyes, but it is only the beginning. The sample size is relatively small, and the diet wasn’t followed closely. It leaves more questions unanswered than before if anything. The fact that the diet was so impactful and beneficial is enough to convince me that it is worth people with depression trying to give it a go, but I’m sure as more RCT’s come around we will find even better options than this. With all that being said, depression is multi-factorial and I’m sure there are instances where dietary changes won’t have much impact at all, so please don’t read into this too much and assume that I’m believing that this is the “cure” for depression. From a practical standpoint there is one area that I am really focused on. The big nutritional challenge for a lot of people with depression is that they can go off-track big-time when their symptoms hit them hard. I have seen this time and time again. It leads me to a big question – if they stick through this for 12-weeks and stay on track and go into remission (or at least significantly improve their symptoms) does that mean they will no longer have those episodes? This would then set it up for them to have much greater control over their diet going forward. From another perspective though it might be overly optimistic. I can never fully understand what it is like in those situations, having never experienced it myself. Potentially it is too difficult during those times and in the real world to stick with it. I really don’t know the answer. My key takeaway message is that I think it is worth having a go, because even though these participants didn’t stick with it 100%, they still got incredible results on average.